Medical and beauty professionals call it submental fat; most of us call it a double chin – but nobody is a fan of it. Epitome Med Spa is proud to offer Kybella, the nonsurgical alternative to liposuction that clients swear by and medical and aesthetic professionals trust for eliminating unattractive fat below the chin. Deoxycholic acid is the active ingredient in Kybella. Naturally found in the human digestive system, the acid begins to slowly dissolve the casing of fat cells after being injected. The cells are then gradually eliminated by the body. Approved by the FDA in 2015, the technique has produced outstanding results for patients who wish to get rid of their double chins without the need for plastic surgery. -Approximately 2-6 treatments are required for good results, depending on the amount of submental fat. -Ultimate outcomes compare favorably with liposuction, without the inherent risks of a surgery. 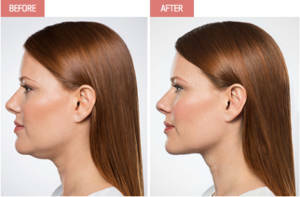 -Kybella is a “lunch time” procedures that takes as little as 20 minutes per treatment to administer. -Since swelling and tenderness are normal immediately after a treatment, there is some brief downtime associated with Kybella. -Improvements are gradual and can continue for months following the treatments. -Serious side effects are rare and not life-threatening. -Kybella should never be injected when the area underneath the chin is infected. Ready to Become Single-Chinned? Call us! If Kybella from our friendly and skilled medical and beauty professionals at Epitome Med Spa sounds like something you would be interested in, we would love to hear from you. To get started call us at 818-963-8693 or get in touch via our contact page.